Teams had a well earned full Pit Stop after two amazing Legs in Kazakhstan. 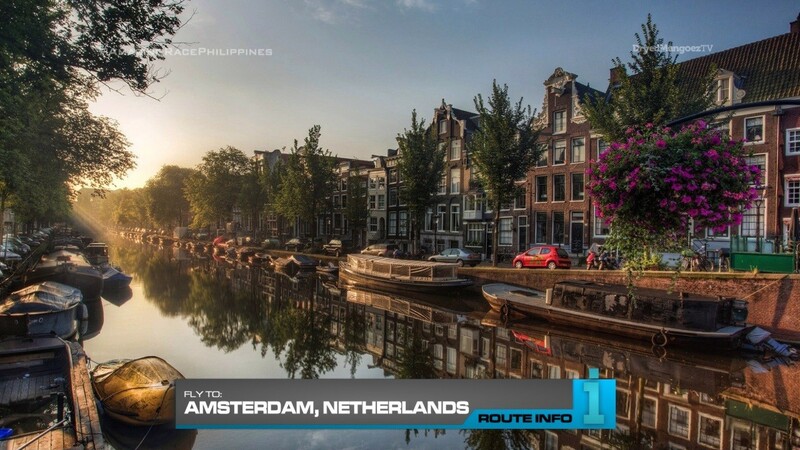 But it’s now time to start the next Leg and teams learn that their next destination is Amsterdam in The Netherlands! Teams will make their own travel arrangements, but really all teams will be on the same direct KLM flight from Almaty to Amsterdam arriving at 7:25am. 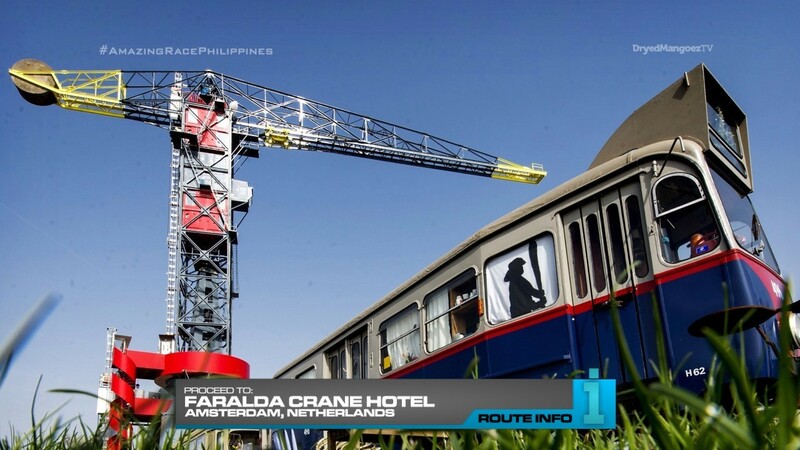 Once in Amsterdam, teams must make their way to the Faralda Crane Hotel to find their next clue. And that clue reveals a Road Block: Who’s on the mark? 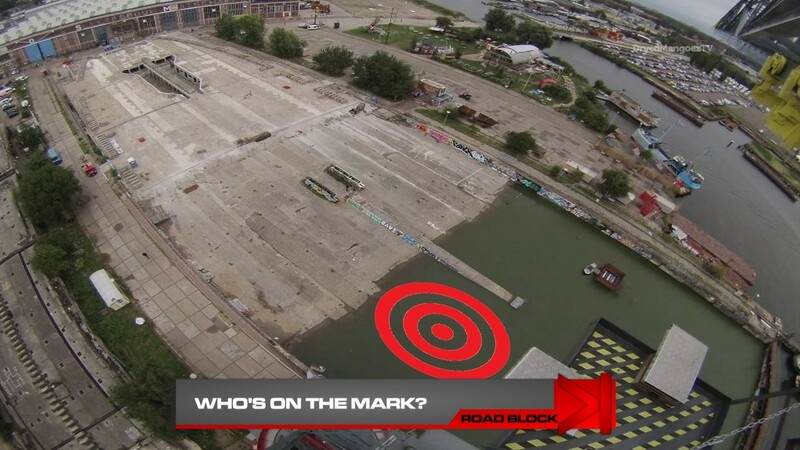 For this Road Block, teams will bungee jump from the crane and throw a ball onto a large ringed target placed in the water. They must hit it in the middle ring to instantly receive their next clue. If not, they will wait out a penalty which will be determined by the four outer rings: 10, 15, 20 or 25 minutes. If they miss the rings completely, they must go to the back of the line and attempt the task over until they hit the target. 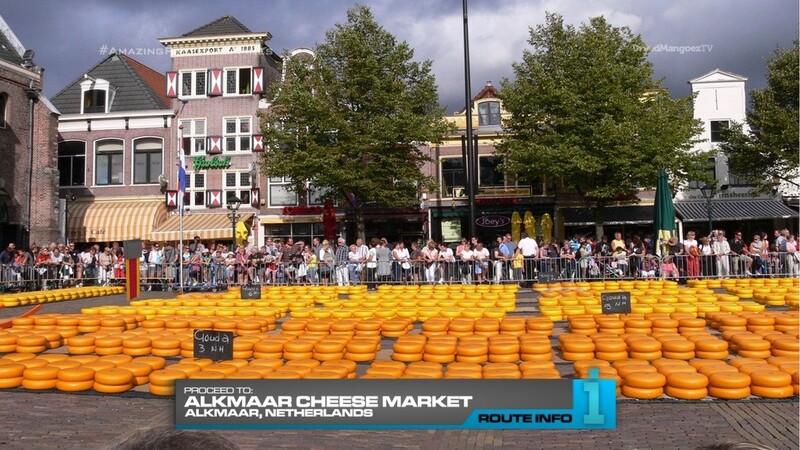 After the Road Block, teams must head to the iconic Alkmaar Cheese Market. 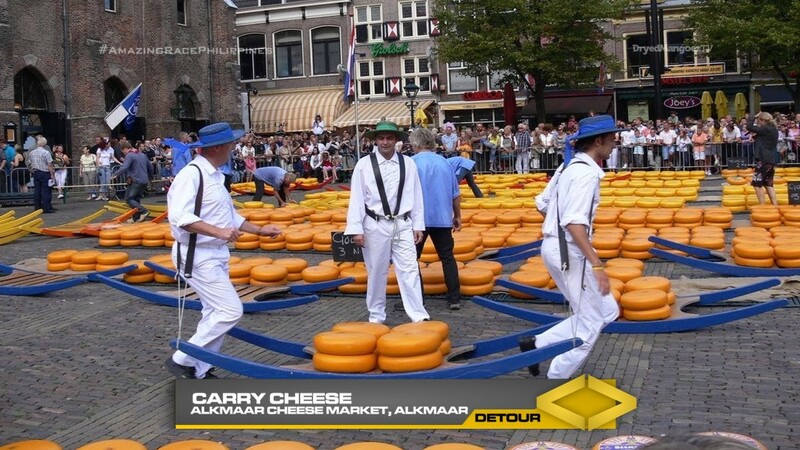 And here, teams will find the Detour: Carry Cheese or Careful Cheese. For both Detours, teams must wear traditional Dutch clothing including wooden clogs. In Carry Cheese, teams must use a wooden stretcher to carry cheese from a stockpile to a nearby scale. 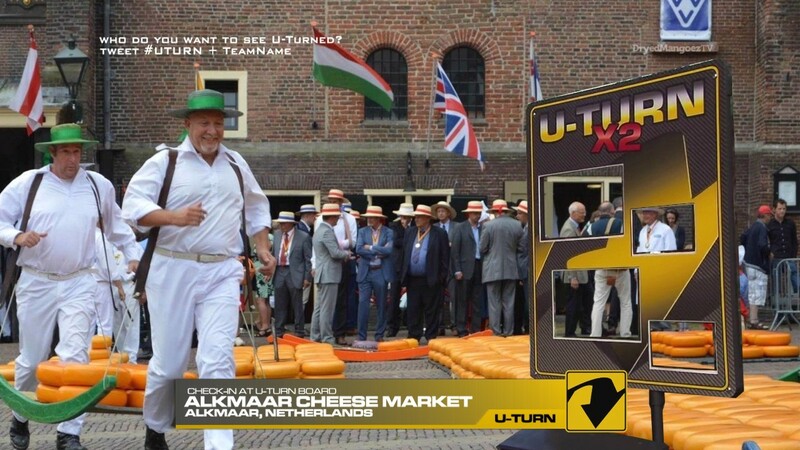 Once their chosen cheese weighs in at exactly 750 kgs, no more, no less, teams will receive their next clue. In Careful Cheese, teams will be given two logo designs of two stores and/or restaurants in the area. 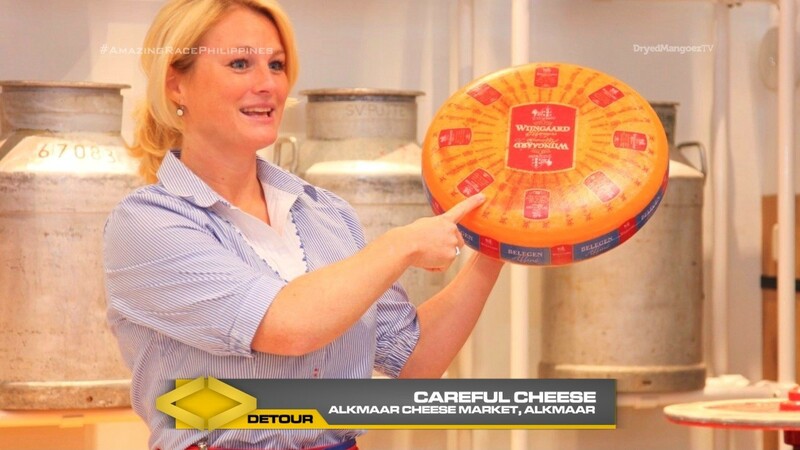 Teams must search amongst the hundreds of cheese wheels in the market for two that match the designs. They must then deliver the cheese wheels to the stores where they will be given receipts to exchange for their next clue. After completing the Detour, teams must find and check-in at the Double U-Turn board. 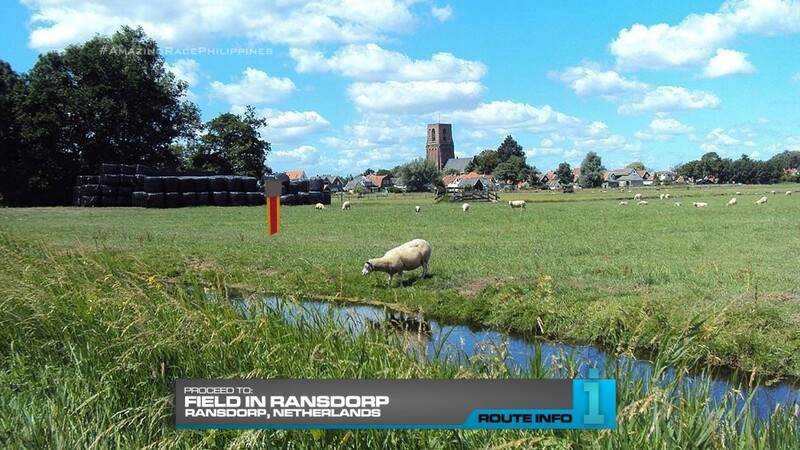 Teams must now take a bus to the town of Ransdorp and find a marked rural field for a cluebox. And here, teams will find another Road Block! Who’s ready for a last ditch effort? The team member who did not complete the first Road Block MUST perform this one. And for this Road Block, teams will play a sport called fierljeppen by completing a vault over a 12 foot irrigation ditch to land on the grass on the other side without touching the water. Teams must retrieve a replica of a Rembrandt drawing and return to the other side the same way they came. They will then be given their next clue which tells them to ride a bakfiets to the Pit Stop. 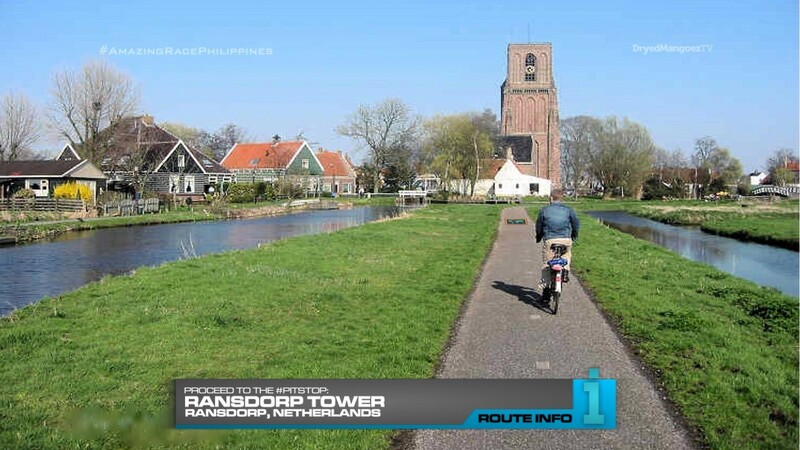 Teams must figure out the drawing is of Ransdorp Tower, the Pit Stop for this Leg of the Race. This should be a solid little Leg in Amsterdam which is a necessary connection city out of Almaty. But it’s the first TARPHDME visit to the Netherlands so that’s good too. So I decided to find something else you could do with the cheese wheels in the market. Detours that are right in the same area are interesting. It might also provoke teams to switch which causes some drama of course. And the U-Turn was a no-brainer as well, especially just in the same area. The Randsorp Road Block and Route Markers are from TAR12. The Road Block should be lots of fun. And teams will have no choice as to who will complete it. So that will add more possible hilarity. 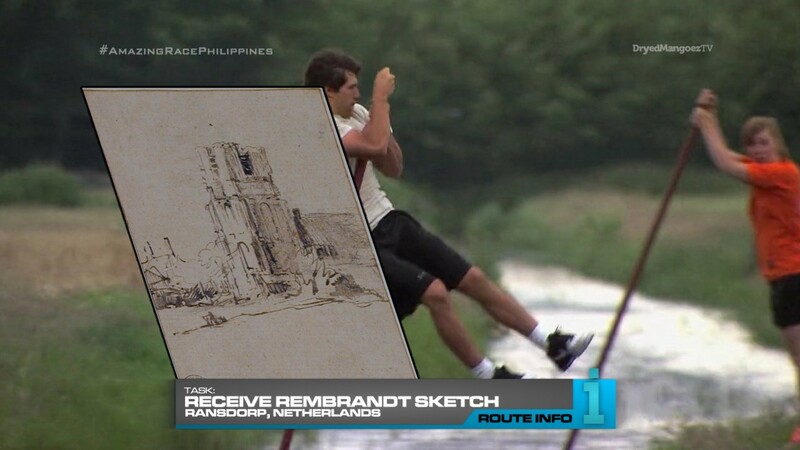 And the bakfiets is just an extra challenge, especially with needing to figure out what Rembrandt’s drawing is off. Plus another chance for fun with teams falling over in the bike. Overall, a solid Leg I think.